Happy New Year! 2009 has finally come to an end and I am whole heatedly looking forward to 2010. 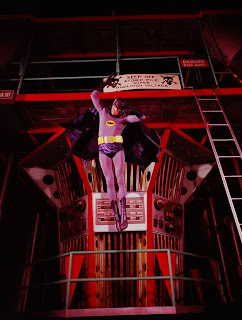 I close out the year with a shot of Adam West as Batman in the Batcave from the TV series that I have never seen before. 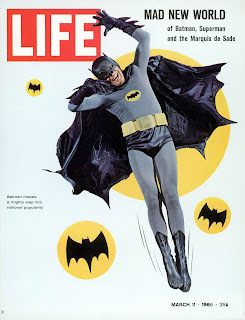 It is very similar to the Life magazine pose, but has the Batmobile's atomic pile in the background. I am not sure if this is the source picture for the magazine cover or just a cool photo shop. Nevertheless, I thought it was cool to see a new photo. In 2010 The Batcave Toy Room will begin to reveal more of my toy collection, movie memorabilia, and comic books. Plus whatever else genre and sci-fi related items that are of interest. If you have anything you would like to share, please send it our way. You can contact us at thebatcavetoyroom@gmail.com. Hope every one has a safe New Years Eve and be careful...Batman can't be everywhere. For more Batman Stuff check us out.